I've been gnashing my teeth lately wondering how best to support my mast and boom while gluing up the staves. I tossed around a bunch of ideas; buying a bloody big plank to clamp everything to, buying some steel or aluminium RHS... Each of these options is moderately expensive and I'm left with a bloody big lump of wood or metal that I have no idea what to do with, and that will be difficult to store. Rather than a quick jury-rigged solution, I thought instead I could build a nice spar bench, on which I can build the mast and boom, and which would be a useful piece of furniture in it's own right, giving me a place to store a whole pile of stuff that rattles around my main bench and floor, and giving me a really nice work surface in addition to my main bench. 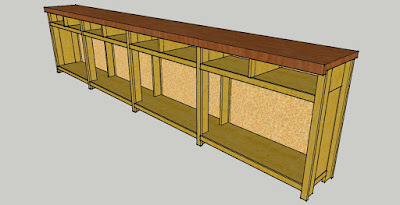 A nice solid Jarrah top, Tassie Oak framing, and sides, back and shelves in ply. The gaps across the top will accept 450mm wide by 400mm deep drawers, and there's some useful cupboard space underneath. For now I'll build it open as in the drawing. I'll add cupboard doors and drawers as finances allow. They're made from 90x19 and 42x19 Tassie Oak, joined with a mortise for lots of strength. I'm adding adjustable feet so the whole assembly can be really accurately levelled. 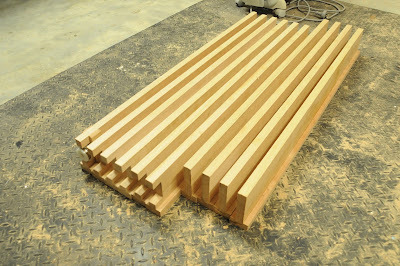 The timber for the bench top is gorgeous. 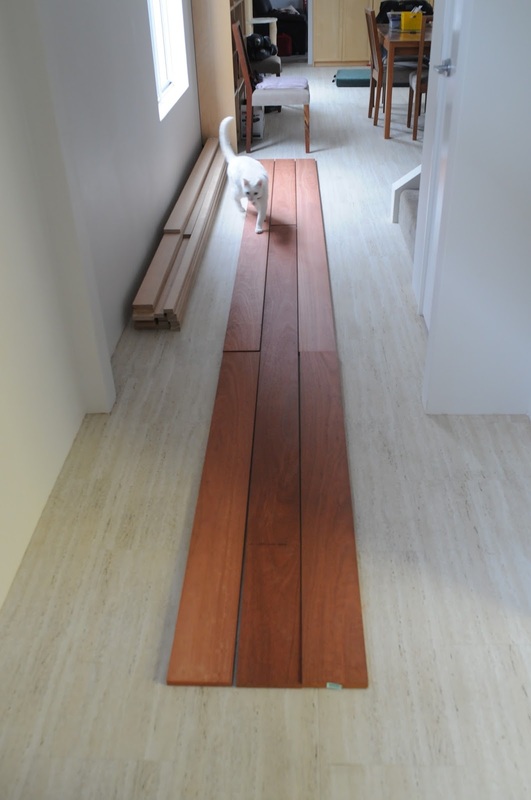 150x19 Jarrah planks. Mogget thinks they're a great idea. I'll laminate them onto a couple of bits of 19mm thick ply, for added strength, then add a lip on the front for face clamping. I confess I did ponder building a 40mm thick solid Jarrah bench top, but couldn't justify the added expense.